This county list is based on field work by Paul Pratt as well as published accounts by E.M. Walker (who was born in Windsor in 1877) and others over the past century. Recent additions to the list include American Rubyspot 2014, Striped Saddlebags 2010, Band-winged Dragonlet 2008, Great Spreadwing 2002, Lilypad Fork-tail 2001, River Bluet 1998 and Royal River Cruiser 1997. The following 94 species are listed as (C) common to abundant, (U) uncommon, (R) rare, (V) vagrant and (X) no occurrence after 1976. Common names follow usage by the Dragonfly Society of the Americas . 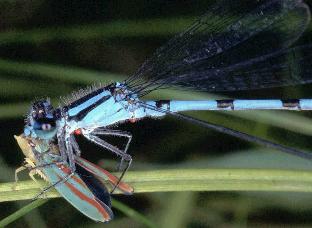 Link to: Odonata of Southwestern Ontario with county lists and many photos. Copyright � 2002-2014. All rights reserved. You are on a City of Windsor Web Site.